The net is a great source of information in storms like this. In fact, sometimes you get too much data, but you can eventually sort through it to come up with a pretty good picture of the current situation. 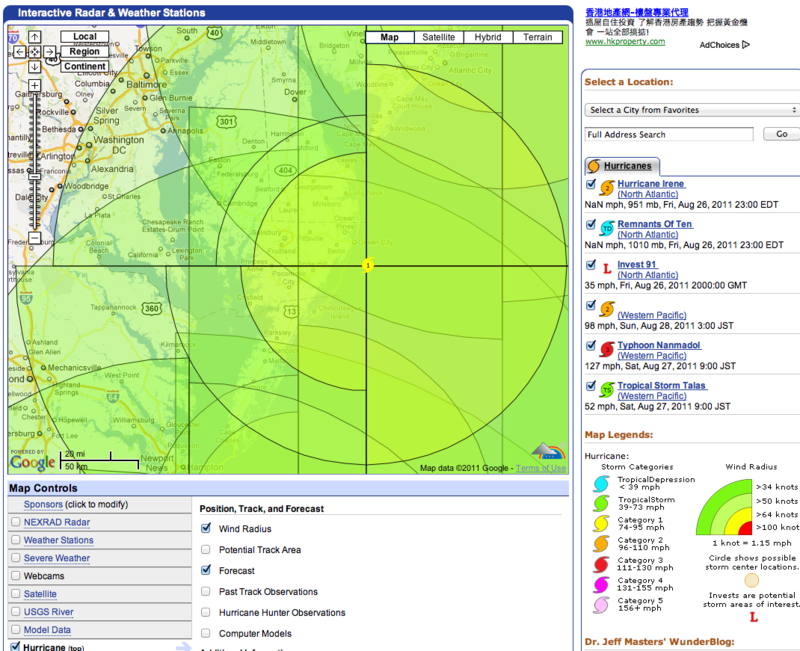 This weather map from WeatherUnderground shows the potential wind speeds from Hurricane Irene. Starting from the hurricane icon off the coast of Ocean City, those in the closest rings will have hurricane force winds. As you’ll note they are stronger on the right side than they are on the left. What I’m talking about below is for the circle WHEN the hurricane is in the position in Ocean City area, not when it is moving up to that area. The next ring is tropical storm winds > 50 knots per hour but less than 73 knots. This includes parts of the Eastern shore just about to Cambridge. The next ring, the largest ring, is tropical storm winds > 34 knots and < 50 knots. This includes basically everyone East of Bethesda, East of Woodbridge, East of the Mixing Bowl. Please note the storm will be moving, which is why toward the bottom you see the remnants of other circles drawn. There you will see a large swath of hurricane strength wind to the right of the storm when it the hurricane icon (not seen) is south of Newport News. In this ‘circle’ you’ll see hurricane strength winds extending over nearly the ENTIRE Eastern Shore. What does this mean in English? Check out the Washington Post’s story on Wind Speed and what it means for your home and trees. You can monitor the wind speeds on the various bouys in the Chesapeake Bay if you so desire, all from your mobile phone.